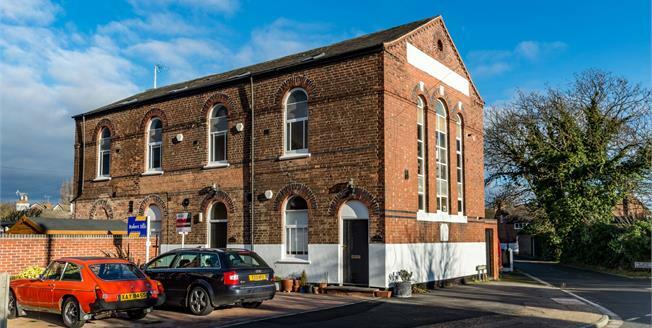 This stunning, duplex apartment with period features is set within a converted chapel and boasts some fantastic original features, some of which include exposed wooden beams and original chapel windows. Set over two floors, to the first floor is an open plan lounge/diner, kitchen and WC. To the second floor are two double bedrooms and family bathroom. The master bedroom is a great size and benefits from a spacious en suite bathroom. The property also has a large, secure storage area just inside the entrance to the building. The property also boast excellent school catchments for infant and junior schools and is just a short walk from Chilwell Manor golf club and Attenborough Nature Reserve. Radiator, wooden flooring, windows to the front and side. Roll top work surface, wall, base and drawer units, stainless steel sink with mixer tap and drainer, integrated electric oven and gas hob with extractor hood over, integrated dishwasher and washing machine. Heated towel rail, tiled flooring. Low level WC, panelled bath, corner shower, pedestal sink. Double glazed velux window. Heated towel rail, tiled flooring. Low level WC, stand alone claw foot bath, pedestal sink.